JWC – The springing up of many digital start-up business fuelled by global venture firms’ fund indicates economy’s direction to the future. Innovation and internet (internet-based firms) become chief drivers to the future of economic growth. The issue was brought up at the U.S. Innovation Roadshow seminar, on the subject of “How to Apply Innovation to Make a Successful Company”, held Friday (4/3) in JWC Campus. 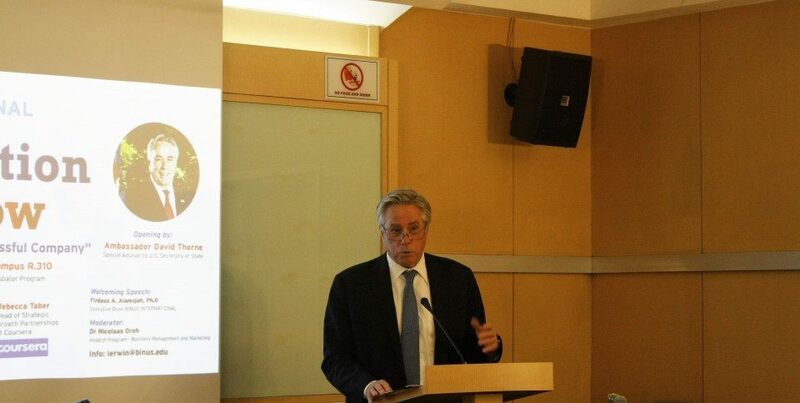 The seminar was attended by Special Advisor to US Secretary of State David Thorne as representatives of US Government; representatives of American technology companies, such as Qualcomm Senior Vice President Engineering Susie Armstrong, Coursera Head of Strategic Growth Partnership Rebecca Taber, and GE Indonesia Director of Government Affairs and Policy David Hutagalung. Each of them shared stories about how their firms use innovation. “Digital economy development is likely to get more significant in the future. In the US, internet contributes up to approximately 6% of GDP. Whereas in Indonesia, only 1%. 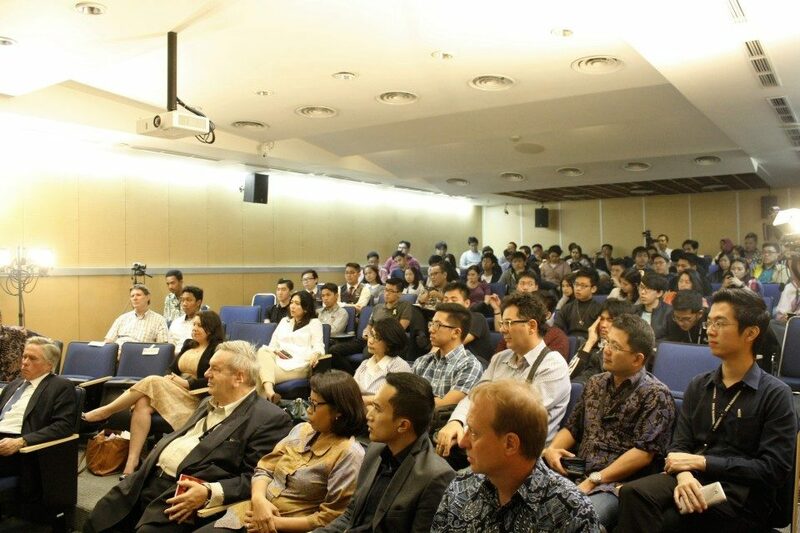 Indonesia has a giant opportunity for grow,” revealed David Thorne who opened the seminar. On that occasion, David Thorne also disclosed that one of US foreign policy is contributing to the realization of inclusive economic growth throughout the world, wherein innovation and entrepreneurship serve as engines for economic growth. 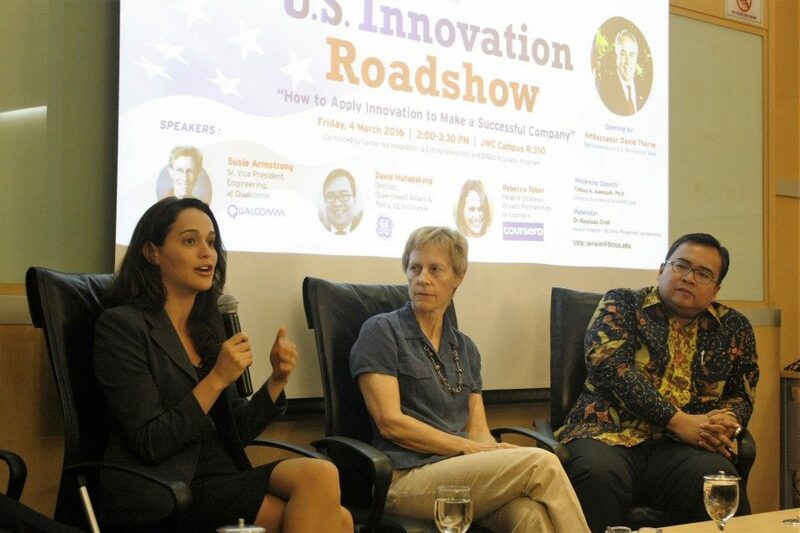 For background information, US Innovation Roadshow is one of the earliest activities under US-ASEAN Connect’s initiatives which was initiated by US government under President Barrack Obama which aims at strengthening US-ASEAN economic relations. David Thorne suggested the importance of developing technology sector for Indonesia in order to strongly support Indonesia’s economic growth in the future. Digital economy may respond to the urgency to create new jobs for Indonesian workforce which are mostly less than 30 years old. A good example of digital start-up firms contributing to encourage people’s economy is Go-Jek which is a relatively succesful phenomenon. Technological innovations that can provide solutions for people’s problem is much needed as well as create opportunities for entrepreneurs for future development. Speaking of innovation, Susie Armstrong observed that university’s role is significant too. “Innovation must become a culture and this can be cultivated since college years,” said Susie. Big companies often fail to cultivate innovation because it has proven its business performance in the industry. However, it should be anticipated by preserving an innovative culture. “For example, at Qualcomm we often hold competitions for employee groups to create innovations, both for work processes as well as for new products. This can help keep an innovative culture growing in big companies like Qualcomm,” explained Susie. 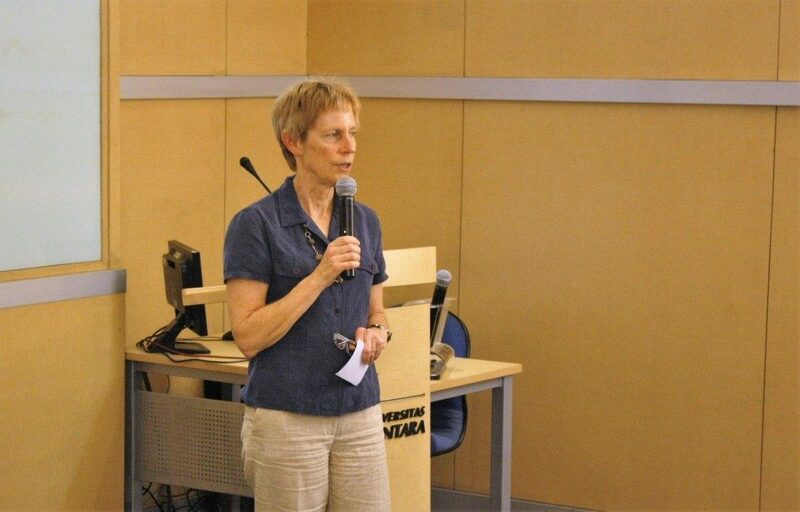 Coursera’s Rebecca Taber elaborated on her company’s innovations in educational areas. “We provide educational platforms in partnership with diverse universities and organizations throughout the world and offer online courses for everyone,” said Rebecca. Coursera has found a gap between workers’ skills and industry’s standards. Additionally, US government’s education statistics suggested that on average, online learning method generates a stronger outcome of students’ learning process than in-class learning activities. GE Indonesia’s David Hutagalung briefly described GE’s history of innovation since its founder Thomas Alva Edison. GE is a technological entreprise, not only creating innovations for its technological products, but also for a variety of work processes, including communication. Agreeing with Susie, David emphasized that innovative culture must be preserved in every area of a large corporation. In his opinion, GE’s decision to start entering software business is an innovative step, apart from going into renewable energy sector.